Lemax Happy Christmas Mr Scrooge! Table Accent depicts an animated dickensian scene of a happy Scrooge holding up Tiny Tim in joy besides a candlelit street light at Christmas. 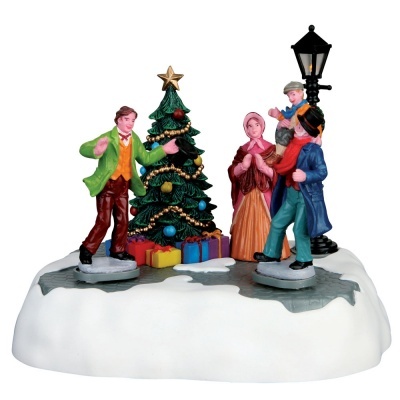 A delightful battery operated miniature Lemax table piece to compliment your miniature Winter village display. Scaled and themed for placement in and amongst your Lemax scene to add movement to a Christmas setting. Two male figurines pivot left and right in joy, happily celebrating Christmas in the home of Tiny Tim. A delightful polyresin scene placed on a single individual snowed base. Battery operated as standard, powered by an internal battery compartment underneath (also mains adaptable). Happy Christmas Mr Scrooge recently joined the growing Lemax Caddington Village collection in 2016.